We have a very special ‘guest yogi’ for this month’s Yoga Manchester People blog. 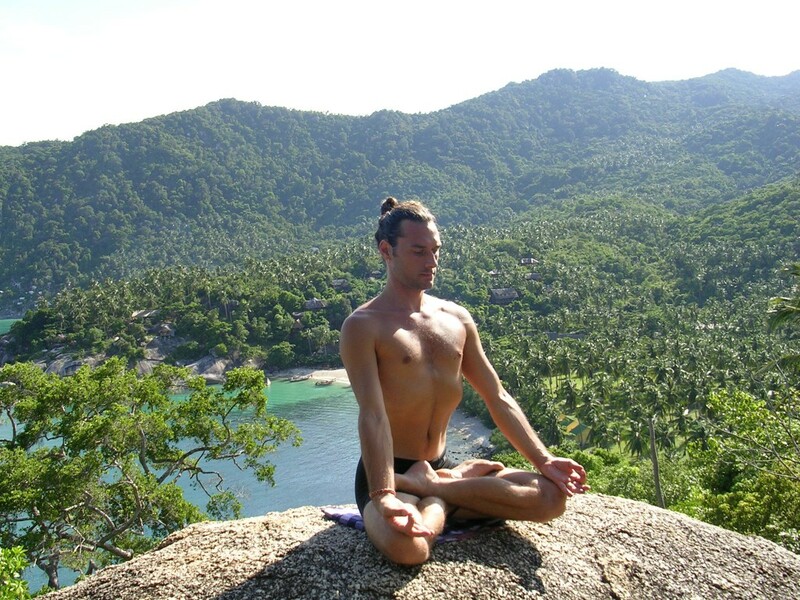 Yoga Manchester caught up with London based Ashtanga Yogi Charlie Taylor-Rugman. Charlie will be in Manchester at the end of November to teach a Pranayama workshop. I live in London and I teach yoga privately. I like to go to see stand-up comedy and I also watch a lot of modern circus. A few years ago I started slacklining and unicycling and met someone who was studying Chinese pole. This is what got me into watching circus. These days circus is based on people and there are no animals in the shows. It’s amazing to see the physical prowess of the performers. They are incredibly dedicated to what they do and I find it really inspiring. I am also fascinated by anatomy and physiology so I spend a fair portion of each week studying to improve my knowledge of the body and how it works. My wife and I are also lucky enough to spend plenty of time travelling for fun which is really enjoyable. Two weeks ago I got an earworm, one of those phrases from a song that constantly repeats itself in your head. It was a song from Paul Simon called Graceland. I found the album on Youtube and I have been listening to the whole album over the past week. The Graceland album was one of the first albums that introduced music from southern Africa to a larger audience in the west, so it is pretty significant in a number of ways. I find I don’t really listen to music that much. Living in London can be very noisy and I find that increasingly I prefer silence. I started reading books about yoga philosophy when I was an undergraduate. I then started learning to meditate with some Tibetan monks who happened to be visiting England. I was taken to my first yoga class by one of my housemates whilst I was at university. It was an Iyengar-style class and I liked the precise way that the asana were introduced. I stuck with it for a while but then one day I saw someone in a martial arts dojo practicing what I knew were yoga postures but in a really flowing style. I had just seen Ashtanga Yoga for the first time and I knew that this was what I wanted to learn. I spoke to the guy who was practicing and he started teaching me. That was in 1992. I have been practicing ever since. Pranayama. I have been practicing pranayama for 15 years. I love my daily asana practice but learning pranayama really takes your postures and your internal experience of them to another level. A daily pranayama practice really gives you a deep insight into how you are feeling each day and how calm or disturbed your mind is. Yoga in all traditions is a practice to still the mind. By practicing pranayama regularly we start to see how the mind works and we cultivate techniques which can help us to develop greater levels of tranquillity and vitality. Since I was a child I have always been interested in Sherlock Holmes, so if I had to be anyone in a film it would be Holmes in the Hound of the Baskervilles. Jeremy Brett who starred in the ITV adaptations of Sherlock Holmes which were filmed in the 1980s is my favourite actor in the Holmes role. He gives a really strong character portrayal and it is very close to what Conan Doyle, the author of the original Holmes stories, describes. I love Holmes’ analytical, observation¬¬ based deductive style of investigation. I often look at yoga postures in a similar fashion. If one of my students is finding difficulties with an asana I use my knowledge of anatomy and physiology to help find out the cause of the problem and also to help to find a solution to allow the practitioner to enjoy the asana. Where in Manchester (or where in the world) is heaven? I don’t know Manchester that well though I have been a number of times. I once wandered around looking for a decent coffee shop very early on a rainy Sunday morning and enjoyed looking round at some of the very beautiful old buildings in the city centre. Mostly I am passing through on my way to somewhere else. Manchester Picadilly is a decent place to change trains. My wife has fond memories of the club scene when she was a teenager. There are so many things that have happened that it might be desirable to change, September 11 or the Second World War for instance. The difficulty with going back in time and changing something is that you never know what might have happened instead, and that might have been worse. Perhaps rather than changing the past we should look to find ways that we can behave with greater clarity in the future. This seems to be one of the key messages in yoga: By acting skilfully we can avoid future pain and anguish.